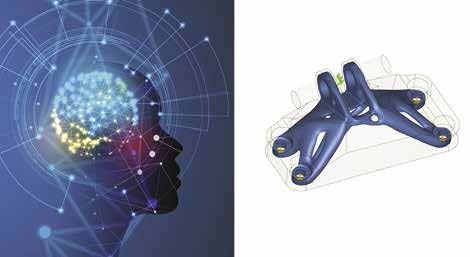 NEEDHAM, Mass.— PTC’s recent acquisition of Frustum Inc., an advanced generative design software company, brings artificial intelligence and generative design capabilities to PTC’s CAD software products. Frustum’s technology for generative design—an approach that leverages artificial intelligence (AI) to generate design options—is a transformative addition to the PTC Creo portfolio, PTC said in a press release. Frustum, based in Boulder, Colorado, offers patented desktop and cloud-based engineering software that enables designers and engineers to go beyond the limits of their personal experience by using powerful AI capabilities that can guide the discovery of high-performance, next-generation product designs. Frustum (https://www.frustum.com/) complements PTC’s strategic relationship with ANSYS and will bring analysis upstream to the very start of the design process. With embedded Frustum and ANSYS capabilities, Creo will be able to recommend design approaches using generative design, guide the user through the iterative design process using ANSYS Discovery Live, and ultimately validate the full product design at scale using the broader ANSYS Discovery suite. With these capabilities embedded in Creo, engineers will have the capabilities needed to rapidly drive product innovation, according to PTC. With generative design, engineers can interactively specify the functional requirements and goals of their design, including preferred materials and manufacturing processes. They can also indicate key design parameters that take into consideration purchasing decisions, manufacturing capacity, supply chain status, and regional-required product variances. The system then uses AI and powerful high-performance computing techniques to present design alternatives for consideration as a starting point or as a final solution. By removing the constraints of human imagination and experience, engineers will be able to interact with the technology to create superior designs and innovative products more quickly. PTC (https://www.ptc.com/) said that generative design is appealing to its customer base as they seek ways to increase engineering productivity, improve innovation and conceptual design exploration, and develop higher-performance designs that are lighter weight, with improved durability. Generative design is also seen as attractive to customers as they work to optimize new products for improved manufacturability, reduce material costs, and decrease manufacturing cycle times; create complex geometries optimized for additive manufacturing; and deliver better products faster.